The Butler Bulldogs take the court at Bankers Life Fieldhouse today against the Indiana Hoosiers. Tip off is slated for 3:45pm, following the conclusion of the Notre Dame vs. Purdue game. The Hoosiers (8-2) enter this contest on a three-game win streak with wins over Northwestern, Penn State, and Louisville. They’ve won those games by a combined five points. The two losses on the season so far were by one point at Arkansas and at Duke by twenty-one points. Indiana is led by Senior Juwan Morgan and electric Freshman Romeo Langford. The Bulldogs will likely have a different look to their squad on Saturday. Duke transfer, Jordan Tucker will suit up for his first game in a Butler uniform. The former Duke player has completed his mandatory period of sitting out a year. Sitting behind a large pool of talent, only playing in a couple games, and not receiving much playing time was the necessary push to find a new home. In an article written by David Woods for the IndyStar, Tucker noted, “I kinda questioned myself as far as confidence-wise. Me leaving Duke was more of like me going to find myself somewhere rather than staying.” Tucker has sought growth in more than just basketball development, focusing on maturing, especially in his habit of responsibility. As he grows, his teammates will continue to grow and evolve with Tucker on the court. Although Tucker has been with the team for nearly a year and has practiced with the Bulldogs, adding him into a competitive game environment will likely create growing pains. With those growing pains, we will hopefully see more often the brighter spots and added value Tucker brings to this Bulldog squad. Finally, if Butler is going to red-shirt any players, we will likely know after this game. I’m guessing that if Markeese Hastings and Bryce Golden don’t play, they won’t play in a game until next season. I observed both of them in the team’s warm ups prior to the contest against Brown. In that warm up, Golden was consistently making 3-pointers. At one point, I counted that he was 16-20 shooting from beyond the arc, something Bulldog fans can be excited about! The Hoosiers have a two-headed monster in Senior Forward, Juwan Morgan and Freshman Guard, Romeo Langford with an able supporting crew. Both Morgan and Langford go-to scorers in the paint. Freshman Guard, Rob Phinisee, continues to impress as he helps create scoring opportunities for this Hoosiers. For the Bulldogs, Jordan Tucker joins the Bulldogs on the floor today. Tucker will likely play a smaller number of minutes today unless there’s a match up that benefits Butler. Sean McDermott will need his spot up three-pointers to fall to help the Bulldogs in today’s contest. He will likely be the difference in this game. 3-pointers – Live and die by the three-point shot. Indiana ranks near the bottom in 3-point shots attempted per game and are an above average shooting team from beyond the arc. Looking closer at the Hoosier three-point numbers, the man to watch out for is Aljami Durham. Durham has improved his shot over the summer and currently averages 43% for season beyond the three-point arc. When playing high-level opponents, Kamar Baldwin is shooting just 1-14 from behind the 3-point line. He’s a major focus on opponent scouting lists, but Baldwin should be able to knock down a few more with the open opportunities has. If the Bulldogs can make nine or more threes, they will be in a good spot to win at the end. Free throws – The disparity in free throw percentage between both teams is vast. 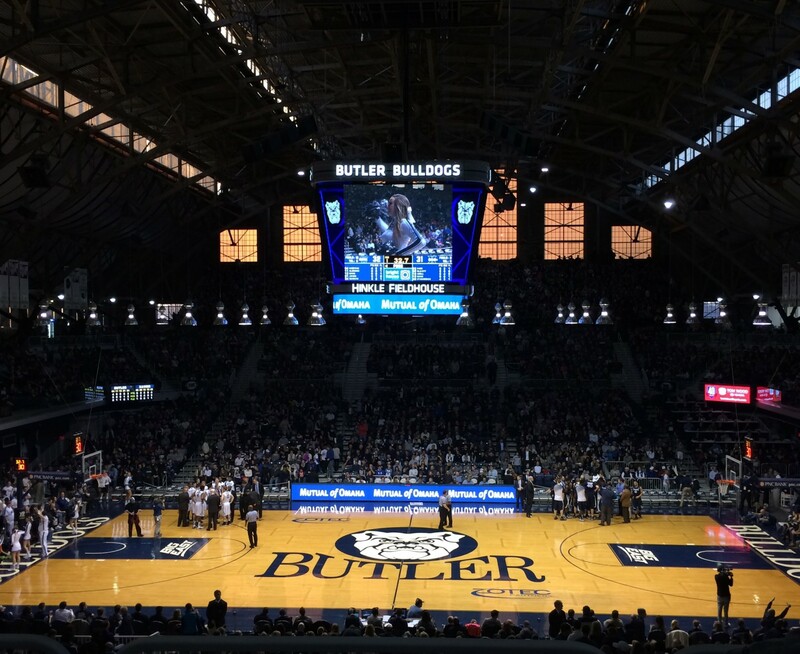 Butler shoots nearly 76% at the charity stripe compared to Indiana’s sub 64% accuracy. It will be in the Bulldogs best interest to attack the rim and finish strong. Sharing the ball – In Butler’s two losses, they had 10 assists against Dayton and only 4 against Saint Louis. In their seven wins on the season, the Bulldogs have averaged 17 assists per game with a game high of 27 against Northern Illinois. Butler can’t rely on pick-and-roll sets at the top of the key and expect isolation plays to work today. It may work against inferior opponents, but the Hoosiers match up well. Turnovers – In their last two games, Butler has turned the ball over only 7 times, or about 10% of their possessions. It is important for Butler to take care of the ball as they have done well for a majority of the games they have played this season. Indiana averages turnovers on more than 20% of their possessions each game. With Indiana’s ability to get into the lane and shoot effectively near the rim, I expect Butler to pack the paint and try some zone during the game if they are getting beat off the dribble. If Butler continues to have active hands on defense to create turnovers and they share the ball well, Butler will end up the victor in this contest. However, if the Bulldogs fail to slow down the tandem of Juwan Morgan and Romeo Langford, they will be in for a long day. As basketball is a game of runs, I think this will be a close game throughout. I have the Bulldogs winning 77 – 74.